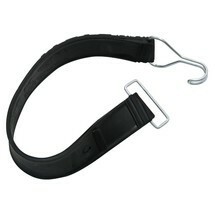 The rubber tension belt for the Classic roll container enables you to secure goods reliably. 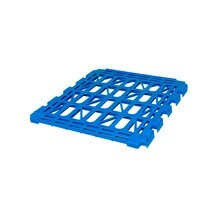 You can also use to it to clamp trolleys or containers together for ease of transport. With this card pouch, you can label filled roll containers and thereby ensure well-organised shipping processes. 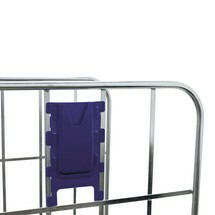 The pouch is simply attached by clamping it to the side grid of the transport aid. 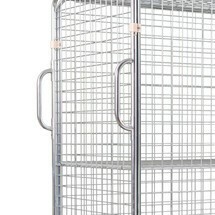 The wire shelf for the Classic roll rack gives you additional storage and transport space. The shelf allows you to transport more goods during each single transport pass. The textile tension belt for the Classic roll container enables you to clamp trolleys and roll containers together to make their transport easier. You can also use it quickly and reliably to secure goods. The shelf for steel roll containers in Euro dimensions enables you to create additional space for transport and storage if required. If it is not needed, the shelf can be quickly removed. 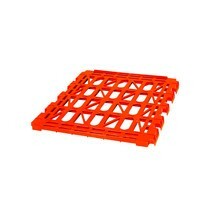 Handles for steel roll containers in euro dimensions make it especially easy to transport fully loaded containers. The handles can be mounted with ease on the frame of the roll container.